In a not-so-distant future, there's a bleak, forsaken landscape. Civilization, absent. Communication channels, silent. All of the people have fled, terrorized by never-ending notifications and antagonizing messages. What could cause such a desolate scene? Okay, maybe that sounds a bit too much like the next superhero blockbuster. But it wouldn't be the first time brands abused a new technology until people were buried in spam up to their eyeballs. You've probably heard: Bots are the future. In fact, if you're wondering today whether or not your business should create a bot, you're asking the wrong question. Bot-powered commerce is our modern-day manifest destiny. But that doesn't mean we can't screw it up. And when a blue ocean channel opens up, we sprint — forgetting the reason people flocked there in the first place. They say those who don't remember the past are condemned to repeat it. 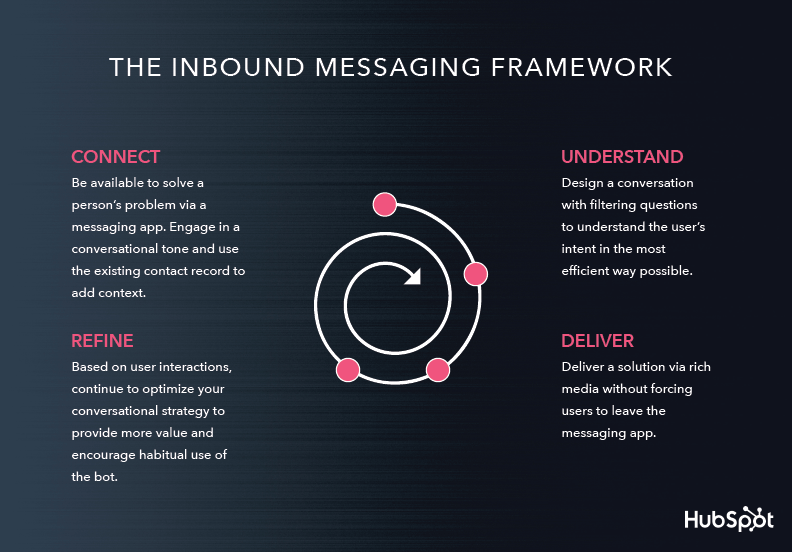 Marketer, business leader, entrepreneur — messaging will be the next great marketing channel. But will you copy and paste your strategies of old and repeat the same mistakes? use this power for good or evil. What is a bot, exactly? No need to overcomplicate it. A bot is nothing more than a computer program that automates certain tasks, typically by chatting with a user through a conversational interface. The most advanced bots are powered by artificial intelligence, helping it to understand complex requests, personalize responses, and improve interactions over time. This technology is still in its infancy, so most bots follow a set of rules programmed by a human via a bot-building platform. It's as simple as ordering a list of if-then statements and writing canned responses, often without needing to know a line of code. Order me a back-up unibeam charger. …and it'll guide you through the voltage options and place the order. Behind the curtain, the bot is leading you through a series of dependent questions to collect the necessary information to understand your intent, and then deliver the right content to satisfy your needs. That's the superpower of bots. They accomplish their task, start to finish, in the place where you already spend your time: messaging apps. Whether it's Facebook Messenger, WhatsApp, WeChat, or Viber, bots integrate with these apps and are available for you to chat with. If you were making plans with a friend, for instance, you could invite a bot into the thread to place a takeout order or call a Lyft — no need to leave the messaging app to open a browser tab, or even another app. Still on for drinks at Josie's tonight? For sure! @Lyft can you pick us up from my house at 7? Why are bots gaining popularity now? David Nelson, CEO of Motion AI, reveals how advances in technology and new business models paved the way for bots. In other words, bots solve the thing we loathed about apps in the first place. You don't have to download something you'll never use again. It's been said most people stick to five apps. Those holy grail spots? They're increasingly being claimed by messaging apps. Today, messaging apps have over 5 billion monthly active users, and for the first time, people are using them more than social networks. It's all a part of a larger shift we're seeing in consumer behavior. As people research, they want the information they need as quickly as possible and are increasingly turning to voice search as the technology advances. Email inboxes have become more and more cluttered, so buyers have moved to social media to follow the brands they really care about. Ultimately, they now have the control — the ability to opt out, block, and unfollow any brand that betrays their trust. In the great bot race, you'll need a differentiator. Vedant Misra, artificial intelligence tech lead at HubSpot, explains how personalization drives repeat users. But, if you're able to provide actual value in the places they already spend their time, everything changes. All any buyer wants is the most direct line between their problem and a solution. In the future, that line is a bot. With the help of messaging apps, bots help consumers find solutions no matter where they are or what device they use — no forms, cluttered inboxes, or wasted minutes spent searching and scrolling through content. Communication, service, and transactions intertwine. And unlike the self-serving marketing of the past, bots provide a service. Being useful is the priority. It all began so well. After years of disruptive ads, spammy emails, and cold calls, content marketing was heralded as a way to build relationships based on trust — marketing people could love. But the more content we created, the less lovable it felt. And we pummeled people with email to make sure we racked up the views and conversions we needed. Somehow making a single purchase meant brands had permission to email you every day from now until eternity. You see, marketers don't have the best track record with new communication channels. And it's not hard to see us ruining bots just as we did with content and email. Perhaps you subscribe to your favorite publication only to be overwhelmed by 10 notifications a day. Or you want to find a restaurant recommendation in San Francisco for your trip next week, but the bot can't understand that you're not yet there. Book a repair appointment on Saturday for my helmet. What type of damage did your suit suffer? Not my suit. My helmet. Sorry, I'm just a bot. I'm afraid I don't understand. It's the double-edged sword of messaging. Bots provide a scalable way to interact one-on-one with buyers. Yet, they fail when they don't deliver an experience as efficient and delightful as the complex, multi-layered conversations people are accustomed to having with other humans on messaging apps. Too often, bots lack a clear purpose, don't understand conversational context, or forget what you've said two bubbles later. To make it worse, they don't make it clear that they're a bot in the first place, leaving no option to escalate the matter to a human representative. Before you build a bot, know your purpose, platform, and promotional plan. Adelyn Zhou, CMO of TOPBOTS, unpacks the top mistakes people make when they decide to build a bot. This time, our terrible marketing hits much closer to home. When you spammed someone's email, at least there was technology to filter out the noise. But since bots function inside messaging apps, you're invading and polluting a historically personal space. They'll unsubscribe from your bot without thinking twice. The stakes are high to get messaging right. Consider why someone would turn to a bot in the first place. According to an upcoming HubSpot research report, of the 71% of people willing to use messaging apps to get customer assistance, many do it because they want their problem solved, fast. And if you've ever used (or possibly profaned) Siri, you know there's a much lower tolerance for machines to make mistakes. Beyond users, bots must also please the messaging apps themselves. Take Facebook Messenger. Executives have confirmed that advertisements within Discover — their hub for finding new bots to engage with — will be the main way Messenger monetizes its 1.3 billion monthly active users. If standing out among the 100,000 other bots on the platform wasn't difficult enough, we can assume Messenger will only feature bots that don't detract people from the platform. Of course, each messaging app has its own fine print for bots. For example, on Messenger a brand can send a message only if the user prompted the conversation, and if the user doesn't find value and opt to receive future notifications within those first 24 hours, there's no future communication. But to be honest, that's not enough to eradicate the threat of bad bots. Research from Forrester showed 5% of companies worldwide said they were using chatbots regularly in 2016, 20% were piloting them, and 32% were planning to use or test them in 2017. As more and more brands join the race, we're in desperate need of a framework around doing bots the right way — one that reflects the way consumers have changed. The challenge of building a bot isn't a technical one. It's conversational. Your job is to understand the interactions your audience is already having with your brand. Then, harness the chat interface in a way that yields maximum impact with minimal fluff. Yes, witty banter is a plus. But, the ultimate mission of a bot is to provide a service people actually want to use. As long as you think of your bot as just another communication channel, your focus will be misguided. The best bots harness the micro-decisions consumers experience on a daily basis and see them as an opportunity to help. Whether it's adjusting a reservation, updating the shipping info for an order, or giving medical advice, bots provide a solution when people need it most. Before you get caught up in the technicalities, let's set a framework for building a bot your customer will want to use. No bot is meant to do it all. Instead, it should stick to a single function and do this incredibly well. Bots are not what they used to be. David Nelson, CEO of Motion AI, explains how bots decipher context to deliver solutions in the most efficient way possible. In general, bots can be broken down into two categories: informational bots and utility bots. Informational bots provide users with a new format in which to consume content. For instance, you could subscribe to breaking news alerts based on your reading habits. Utility bots solve a user's problem, whatever that may be, via a user-prompted transaction. The most obvious example is a shopping bot, such as one that helps you order flowers or buy a new jacket. According to a recent HubSpot Research study, 47% of shoppers are open to buying items from a bot. But utility bots are not limited to making purchases. A utility bot could automatically book meetings by scanning your emails or notify you of the payment subscriptions you forgot you were signed up for. If the success of WeChat in China is any sign, these utility bots are the future. Without ever leaving the messaging app, users can hail a taxi, video chat a friend, order food at a restaurant, and book their next vacation. In fact, WeChat has become so ingrained in society that a business would be considered obsolete without an integration. People who divide their time between China and the West complain that leaving this world behind is akin to stepping back in time. They give the user exactly what they're looking for. The more we use bots, the better they'll get. Vedant Misra, artificial intelligence tech lead at HubSpot, discusses why you should leverage consumer data to create more useful bot interactions. Chatting with a bot should be like talking to a human that knows everything. If you're using a bot to change an airline reservation, the bot should know if you have an unused credit on your account and whether you typically pick the aisle or window seat. Artificial intelligence will continue to radically shape this front, but a bot should connect with your current systems so a shared contact record can drive personalization. Respect the conversational UI. The full interaction should take place natively within the app. The goal is to recognize the user's intent and provide the right content with minimum user input. Every question asked should bring the user closer to the answer they want. If you need so much information that you're playing a game of 20 Questions, then switch to a form and deliver the content another way. Start by asking a leading question that determines the single most important variable. Then use follow-up questions — and to minimize friction, option buttons — to gain the necessary context and hone in on a solution. 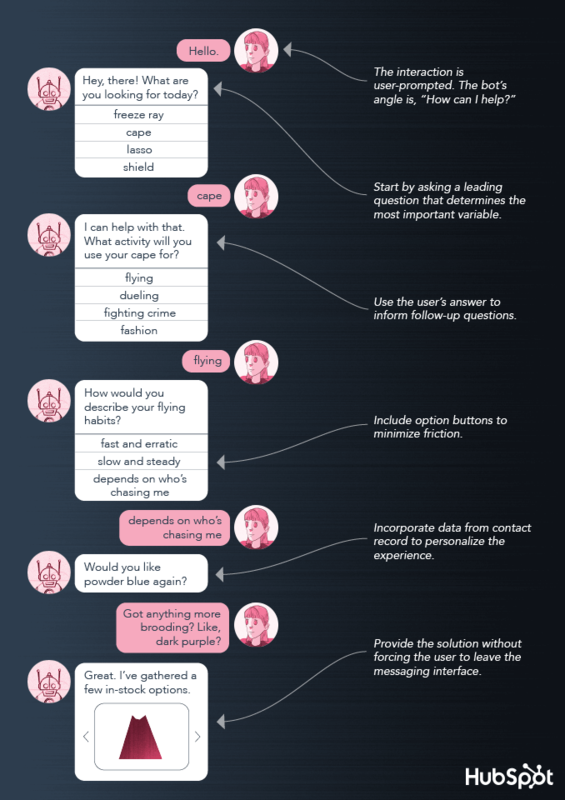 Creating a comprehensive conversational flow chart will feel like the greatest hurdle of the process, but know it's just the beginning. It's the commitment to tweaking and improving in the months and years following that makes a great bot. As Clara de Soto, cofounder of Reply.ai, told VentureBeat, "You're never just 'building a bot' so much as launching a 'conversational strategy' — one that's constantly evolving and being optimized based on how users are actually interacting with it." It's not one wrong step that places a hero into the enemy's lair. It's a series of small decisions, one-by-one pulling the character further away from their original mission. They take their power — one they knew was destined for good — and abuse it for selfish, short-term gains. Let this not be the story for bots. There's no downplaying what bots could do. For brands and consumers alike, we have a chance to redeem communication and commerce. Research would be convenient, purchases streamlined, and service personalized. But just as easily, we can transform bots from helpful to disruptive, wanted to unwanted. Don't miss the opportunity here. By nature of what bots are, they offer a radical new reality. Bots are built to be helpful. They require a person to opt-in. And for the first time, they encourage scalable, one-on-one conversations between brands and consumers. It's the makings of a marketer's dream: a world where brands can build authentic relationships with their buyers, and buyers can learn to trust brands again. bots might be the best thing to happen to marketing yet.